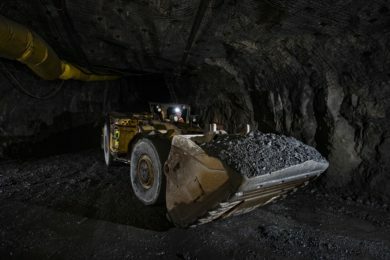 In another sign that the underground mining space is increasingly going electric, Pure Gold Mining has said it intends to use a combination of diesel and battery-powered load and haul equipment at its Madsen underground gold project in Ontario, Canada. The company said all ramp and level waste development would be performed by an owner-operated fleet of one- and two-boom electric hydraulic drill jumbos, 3 cu.m capacity LHDs, 20-t haul trucks, scissor lift/bolters and other rubber tyred support equipment. Following the refurbishment, battery-powered equipment is likely to be used, with the company explaining that its use will “eliminate emissions associated with the movement of ore and waste and will result in materially reduced ventilation and heating requirements”. This information came out in the company’s press release announcing a feasibility study on Madsen, a former operating gold mine in the renowned Red Lake district. Based on a probable mineral reserve of 3.5 Mt at 9 g/t, containing 1 Moz of gold, the company outlined a 12-year operation at Madsen, producing an average of 80,000 oz/y at an all-in sustaining cost of $787/oz. The initial capital requirement of C$95 million ($71 million) would be paid back with an after-tax net present value (5% discount) of C$247 million (using a gold price of $1,275/oz), the company said. The feasibility study supports a high-grade 800 t/d underground mining operation with designed stopes containing 1 Moz of probable reserves, the company said. Madsen benefits from significant mining, milling and tailings infrastructure already in place, resulting in one of the lowest capital intensity, undeveloped gold projects in the world, according to Pure Gold. Mining will be conducted from new ramp development using a combination of cut and fill and longhole mining methods. A new hoist house and double drum production hoist will use the existing shaft infrastructure to hoist ore and waste from the mine, commencing in year four of operations. The Madsen implementation schedule spans a period of 13 months, with underground mine development commencing approximately nine months before the first gold pour. The initial capital outlay of C$95 million (including contingency) supports the construction of an underground mine and associated infrastructure, including the expansion of existing milling capacity to 800 t/d of ore. Assuming the project execution starts in April, the first gold production would be expected in May 2020. JDS Energy and Mining led the feasibility study, which included contributions from consultants such as Knight Piésold, Nordmin Engineering, MineFill Services, Integrated Sustainability, Lorax Environmental Services, Ginto Consulting and Equity Exploration Consultants.